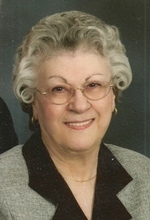 Lou Nell Ballou, age 85 of Ashland, OH., passed away Saturday, February 2, 2013 in Ashland at Hospice House of North Central Ohio. On March 12, 1927 in Langeloth, PA., Mrs. Ballou was born to Tony and Florentina (Marotto) Panella. She had been a resident and homemaker in Ashland since 1968 and a member of Calvary Baptist Church. On February 13, 2000, Lou married Richard Ballou who survives. Also surviving are two sons: Chuck (Brenda) Nell of Lewis Center, OH., Ted (Elaine) Nell of Ashland; three step-sons: Mark and David Ballou both of Ashland and Robert Ballou of VA.; one step-daughter, Debbie Perkins of Greenwich, OH. ; seven grandchildren; 8 step-grandchildren; and 14 great-grandchildren; and one sister, Florence (George) Linton of Whitehouse, TN. Mrs. Ballou was preceded in death by her parents; first husband, Charles Nell in 1985; one daughter, Debra Nell in 1979; one step-son, William Ballou; two sisters: Josephine and Thelma; and one brother, Frank.